Whoopi Goldberg, American comedian, actress, political activist, writer, and television host, shares the history of the Alice in Wonderland statue – one of her own favorite places in Central Park. 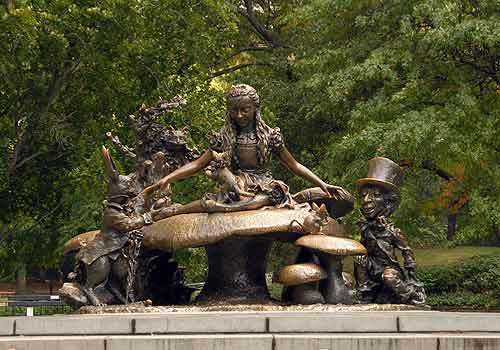 Alice and her cast of storybook friends found their way to Central Park in 1959, when philanthropist George Delacorte commissioned this bronze statue as a gift to the children of New York City. Inspired by the zany characters of the Lewis Carroll classic Alice's Adventures in Wonderland, the sculpture was also meant as a tribute to his late wife, Margarita, who read Alice to their children. Engraved around the statue are lines from his nonsensical poem, The Jabberwocky. The sculpture is a favorite among children, who love to climb atop it and explore its varied textures and hiding spaces. Through the years, thousands of tiny hands have literally polished parts of its patina surface smooth. Created by the Spanish-born American sculptor José de Creeft, the piece depicts Alice holding court from her perch on the mushroom. The host of the story's tea party is the Mad Hatter, a caricature of George Delacorte. The White Rabbit is depicted holding his pocket watch, and a timid dormouse nibbles a treat at Alice's feet.